An artist's conception of how the SIS mobile space gas station will refuel client satellites on orbit. NEW YORK — Aging or broken satellites orbiting Earth could one day get a second life from two different companies hoping to build new spacecraft designed to serve as robotic gas attendants and space mechanics. The Canadian company MacDonald, Dettwiler and Associates Ltd. (MDA) is designing a spacecraft that will essentially function as a flying gas station for out-of-fuel satellites. Separately, Vivisat, which is a joint venture of rocket manufacturer Alliant Techsystems (ATK) and aerospace firm U.S. Space, has proposed a vehicle capable of performing in-orbit satellite servicing. Both spacecraft have the potential to rescue or extend the lives of satellites in orbit, which could be a game-changing technology for the industry, officials said. Traditionally, satellites have been constrained by how much fuel they can carry onboard. Once satellites reach the end of their lives and their tanks are empty, the dead and decommissioned spacecraft clutter low-Earth orbit. Some also pose the risk of colliding with other satellites, or of falling uncontrolled to Earth, like the NASA climate satellite UARS that plunged into the Pacific Ocean in late September. MDA's refueling craft, called the Space Infrastructure Servicing (SIS) vehicle, is also designed to be more than simply a gas station. In addition to loading satellites up with more fuel, the SIS vehicle will be equipped with a robotic arm and tool kit. This will allow the spacecraft to inspect, reposition, tow and make minor repairs to existing satellites. "I think the issue of why we want to do [this] is pretty obvious," said Richard DalBello, vice president of legal and government affairs at Intelsat. "We want to be able to touch our assets, and we want to be able to see them. A large number of satellites are de-orbited that are perfectly good, perfectly functioning satellites. The ability to refuel is a very powerful technology." 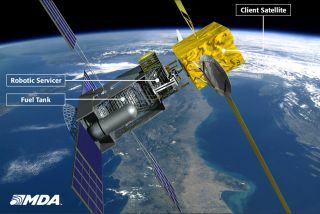 But MDA is not the only company looking to service satellites in orbit. Vivisat's so-called Mission Extension Vehicle (MEV) is also being designed to dock to satellites, but instead of transferring fuel, the MEV's own thrusters will provide propulsion and attitude control, said Bryan McGuirk, chief operating officer of Vivisat. "We found that the majority of missions are actually retired with all subsystems functioning," McGuirk said. "We found a ready market for what we're working with here." Vivisat's design is founded on simplicity, which should help them keep the costs low, McGuirk told SPACE.com. "We want something that mitigates risk," he explained. "For us, the MEV accomplishes that because there's no electrical connection and no fuel exchange." Since the MEV can dock to satellites and use its own propulsion system, the vehicle will also be able to rescue fully fueled satellites that may be in the wrong orbit and boost them into their correct position. Or, the MEV could move a satellite to a different destination to be used for a new purpose, McGuirk said. Being able to refuel and service satellites in orbit will also help reduce the amount of orbital debris and the number of defunct satellites in space, officials said. "We think there's a tremendous market for space awareness," DalBello said. "We believe that there is a tremendous need for greater precision in how satellites are flown in the debris environment." For satellites that are obsolete and not worth saving with extra fuel, MDA and Vivisat's vehicles could boost them into what is known as a "graveyard orbit." This higher orbit gets them out of the way of operational spacecraft, which lowers the risk of collision. Alternatively, the refueling vehicles could tow the dead satellites into a lower position so that they can fall and break up as they re-enter Earth's atmosphere. "This is going to happen," DalBello said. "This is not science fiction. This is within our grasp right now."